Headed outdoors quietly after the family formal portraits, this moment feels like the couple is completely alone, despite the crowds of people awaiting them on the front steps of the Citadel's chapel. The fact that they are standing separately, but have body language that leans toward each other, along with the leading lines of the pews ushering them through the open doors, showcases this strong couple as the two unique individuals rather than just the sum of their parts. Choosing to expose this image so that the brilliant daylight outdoors is blown out was done to represent the blank slate of a future together, where they are headed as a team. 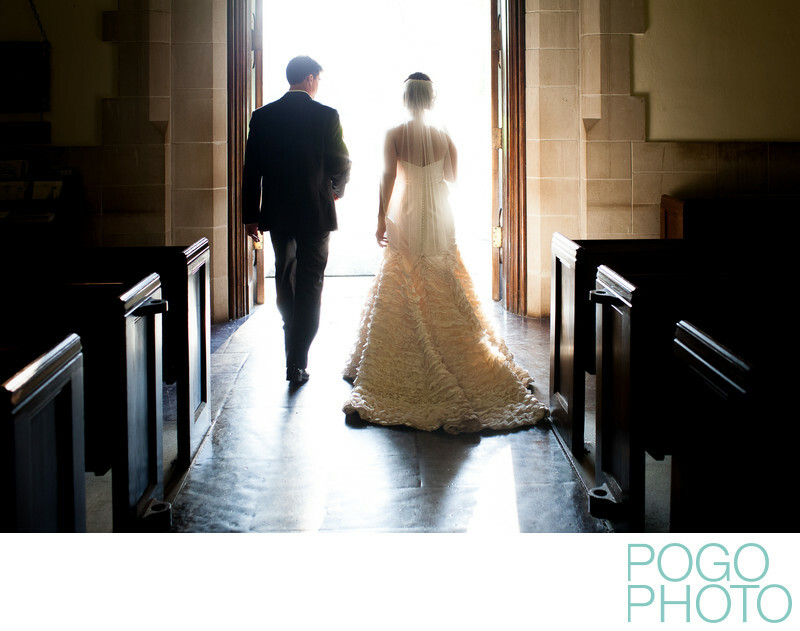 The toning in the post production of this image pulls the warmth of the outdoor sunshine in the highlights and the cool shadows inside the chapel, combining for a pleasing warm-cool balance. The delicate touch of the bride’s left hand down next to her dress mimics the groom’s left hand, and his stride, one foot in front of the other, creates a classic male shape of wide shoulders tapering to narrow feet, while the bride’s wide train of her elegant, layered dress creates the opposite shape, a visually pleasing contrast that has hidden meaning dating back to the earliest forms of art. Our destination weddings are amongst the most challenging work we do, but also the most rewarding. We thrive on creating beautiful images no matter where we are, but the adrenaline rush we get from working in new locations is unlike anything else we’ve done. Photographers are artists, and like all artists we are inspired by new places, the palette unique to that place, the textures and visual feel to a location, whether it’s a city or deep in the country; creating images that capture the feel of a place is one of those special things that feeds our artistic souls. Charleston, a southern gem of a city in coastal South Carolina, has a unique feel. Dripping with elegance, draped with Spanish moss, with hazy-bright sunshine that can burn or glow depending on the time of day, towering old mansions and hotels, cobblestone streets, wrought iron fences and gates: this city has many similarities to Savannah, but without the regimented grid layout of that city. While wandering the streets of Charleston you may find yourself passing restaurants, homes, small shops, cemeteries, bars, museums, or empty lots; unlike larger cities you can pass through most districts on foot, giving you a real sense of place within the city itself. This particular destination wedding in Charleston took place at the chapel at The Citadel, an historic military college campus in the heart of Charleston. The groom and many of his groomsmen were Citadel graduates, coming of age in this sultry southern town, and returning for his wedding to his beautiful bride only seemed natural. There were twenty-six members of the wedding party, so having a private moment between the bride and groom was a small thrill; finding a unique way to document this moment is the kind of thing we strive for at each wedding we photograph. Location: The Citadel, Charleston, South Carolina. 1/125; f/4.0; ISO 2000; 35.0 mm.